What a day... Samsung's Imagine The Pride launch of their latest printer SCX-4500 series was an awesome experience as i had the chance to have lunch with Elaine Daly, Daniel Tan, Eric Leong and Steve Yap. Yes... lunch with them on the very same table. So no chance this time to take pictures of food like how i use to always do when i'm at a press conference or what. Lunch with Elaine Daly was one thing, but lunch on the same table with other celebrities was awesome! I wanted to take picture together with them but was terribly shy because Elaine Daly was there! Hehe... anyways... 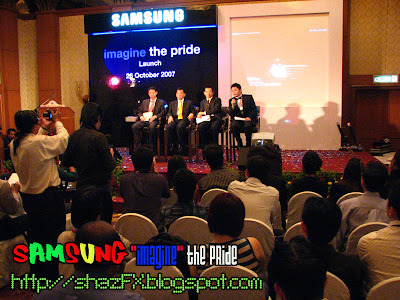 I was put on this table as I was invited by Samsung for the launch. Anyways, I'm updating my personal blog faster than my station's website. Actually, in fact i'm suppose to be uploading these to the station's website first but i've got other stuffs waiting to be pumped over to that side. 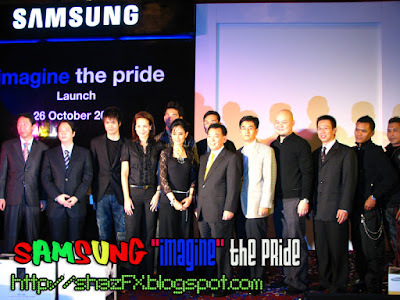 But oh well... let's read all about Samsung's launch of their latest printer here!!! The Samsung's latest sleek monochrome laser printer SCX-4500!!! It's a design of its own, sleek black design with high gloss finish sapphire blue LED's. 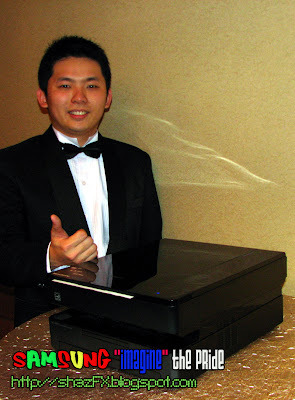 Imagine the excitement and sense of pride that this sleek jewel of a printer will bring to your life. Banish unattractive technology and welcome a trendy laser that will sparkle on your desk and light up your printouts. With Samsung SCX-4500 it’s not that hard to imagine. There was a Q&A session with the members of the media. Questions such as the usage of the printer and its price in the market was asked and answered. Here's Elaine Daly receiving a token of appreciation from Samsung Malaysia. 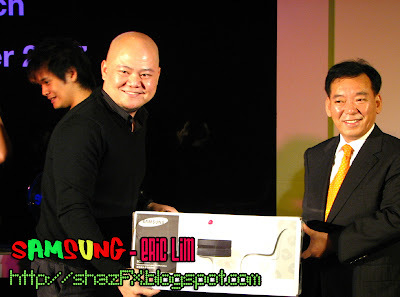 Steve Yap receiving an SCX-4500 from Samsung Malaysia representatives. Not forgetting Eric Leong who is SSF Home Decor's designer...receiving his token of appreciation. Daniel Tan, we first met a long time ago...with Xandria...but anyways here we are again! Syazliana came over to the studio the other night for an interview. Here she is taking back home a sleek SCX-4500 mono-chrome laser printer! The models showing off their printers... the picture is bad because i was really runing on my very last few shots due to battery outage. Here's the printer that everyone has been talking about!~ soon available at many places where consumers look at design as its #1 aspect! Syazliana performing one of her songs here today... Upon hearing her vocals, i quickly asked her to come over to the studio for an interview session!! !